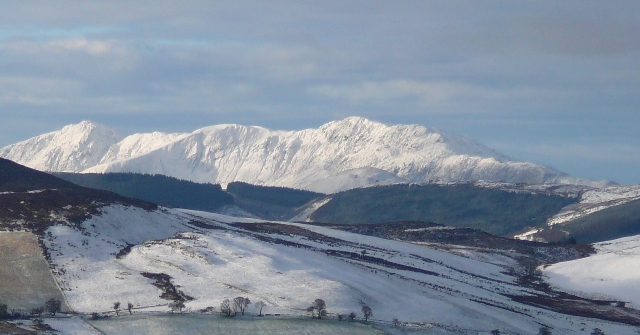 30 March 2019 Ras yr Aran Fell Race..
30/3/19 Ras yr Aran and Meirionnydd Winter Series. Race Winner: Gareth Hughes, Mercia. 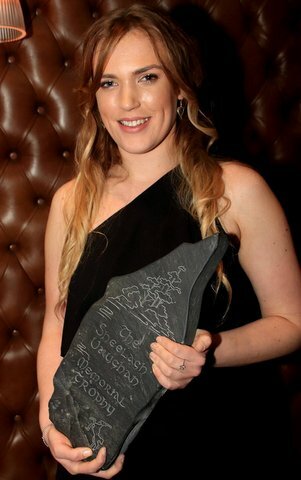 First Lady: Miranda Grant, Eryri. 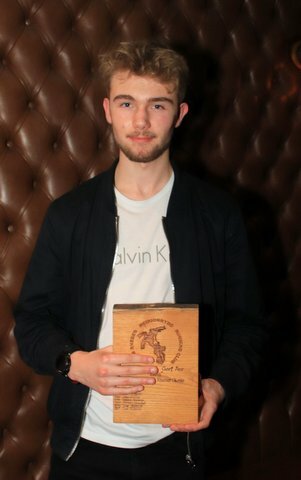 Winter series winner: Tristan Evans, Meirionnydd. 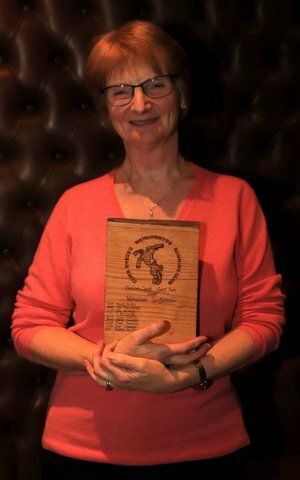 Winter series First Lady: Sarah Willhort, Mercia. 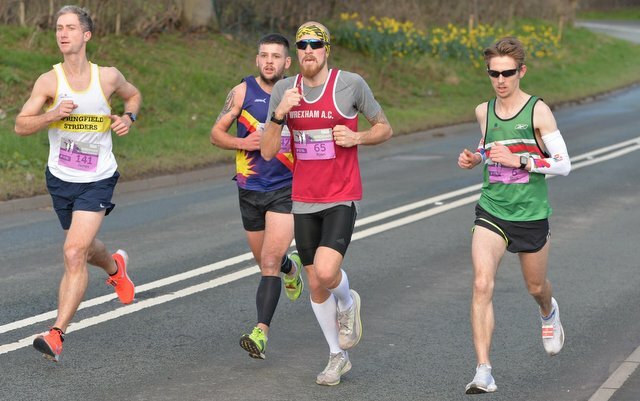 24/3/19 Forest of Dean Spring Half Marathon . 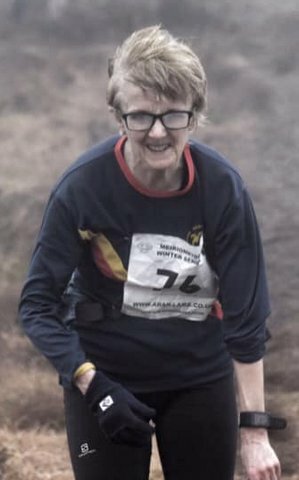 One Meirionnydd runner competing. Richard Hankinson said "It's a well organised event on nice smooth trails with a few hills but nothing too steep. Felt fairly good so decided to push on the flats and downhills and see how it went - didn't look at the watch apart from seeing how far I'd gone to try and balance the effort. Also didn't drink or eat on the run, I've been training myself for that to save time. Really pleased with 1:45:59, my 2nd fastest half by a minute and I've run plenty of flatter road ones! 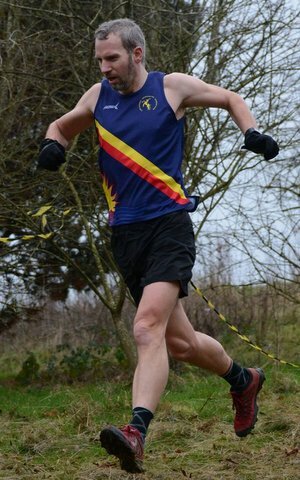 Finished 423rd out of 1900 finishers and happy with 17th MV55 in the Trail Running Assoc short distance championship race that was part of the event. I'd recommend this or the autumn version to anyone, it's a bit of a trek down there but nice surroundings and well supported by spectators." Tom Roberts and Alex Lanz the Reading Half Marathon. Both came away with big pb’s on an undulating course. Tom finished in 1:09:12 and Alex in 1:10:37. 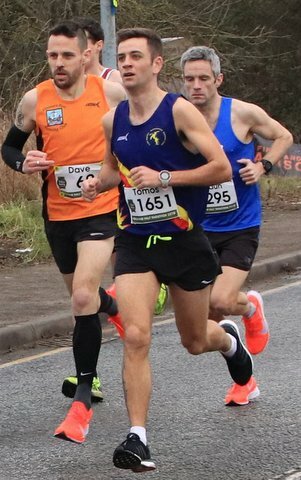 Tom said "Usually after running a good race or achieving a PB I’m on a buzz for a few days and always look forward to get that recovery run in and think back to the race. But that’s not been possible this time. The last few days have been pretty rough and I wasn’t sure if I was going to be able to run the Reading half on the morning of the race. Toothache started on the journey down to Reading on Saturday and didn’t think too much of it. The evening before the race I was in serious discomfort. With just 3 hours sleep and in more pain I thought I’d have no chance of racing. I was gutted and grumpy to think that the 7 week build up for this race was for nothing. Drugged up on ibuprofen and paracetamol I tried a little warm up to see if it was ok to at least start the race. Adrenaline then started to kick in and all of a sudden I was pain free, so awe race is on!! Conditions were good, slight breeze but I’m used to that by now after training on the track in Treborth all winter! I wasn’t expecting the course to be as undulating than it was though. Managed to keep up with a group full of quality runners and training partner @callumrunner22 and crossed the line in 1:09:10 and 27th overall. The finish at the Madejski Stadium was pretty cool with big crowds cheering you on. Since the race I just went from bad to worse. Ysbyty Gwynedd on Sunday night for antibiotics then bedbound for 2 days with a virus. The Infection was caused by a cracked tooth that gave the other tooth an infection on the root. Feel like crap and possibly going to lose two teeth but somehow I managed my target and finally broke 70minutes!" 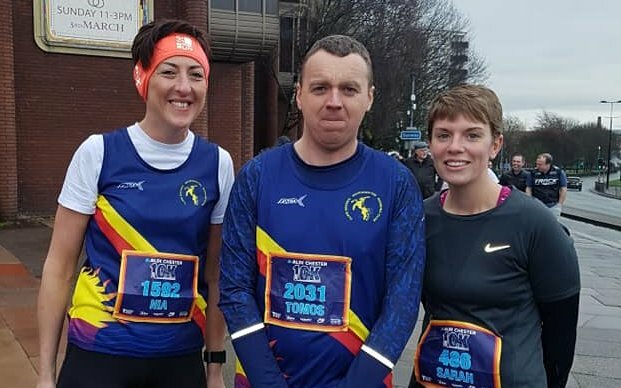 Three Meirionnydd runners took part in the Wrexham Marathon Festival. 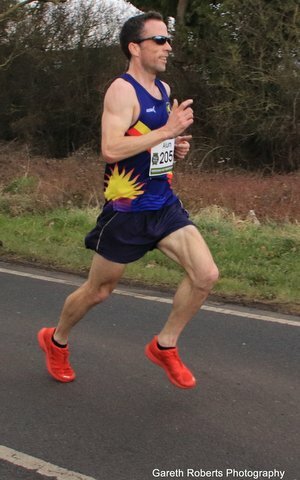 In the Half marathon - Alun Williams finished in 1:15:49 claiming 2nd overall. In the 20 Mile race Gwion Bobo Roberts finished in 2:03:33 and in 6th place overall. And in the Full Marathon Justin Pilkington finished in 3:48:48, 36th overall and 2nd silver medal M45, North Wales Marathon Championship. 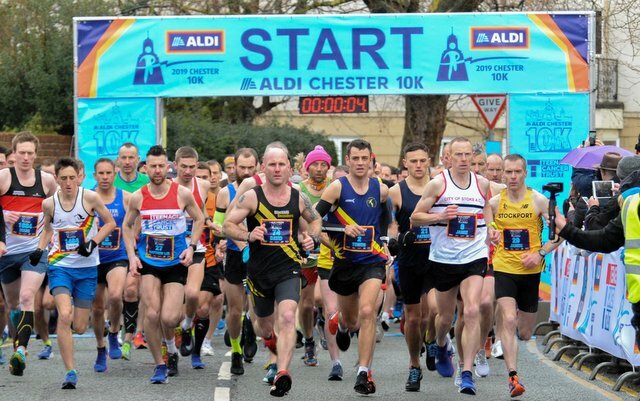 Congratulations to Tom Roberts on his Win in the Aldi Chester 10k with a time of 31:49. Also running today were Nia Evans finishing in 51:37 and Tomos Slattery in 52:13. 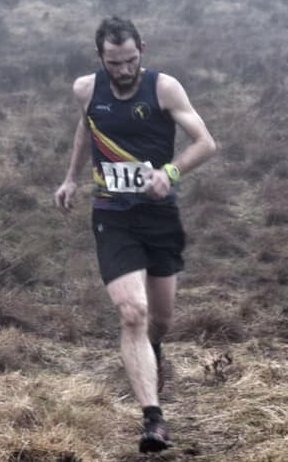 Tristan Evans was the sole Meirionnydd runner in the second counter in the WFRA’s North Wales Championship. The race was won by Michael Corrales from Dark Peak in 35:04 and Tristan finished 2nd in a time of 35:14. 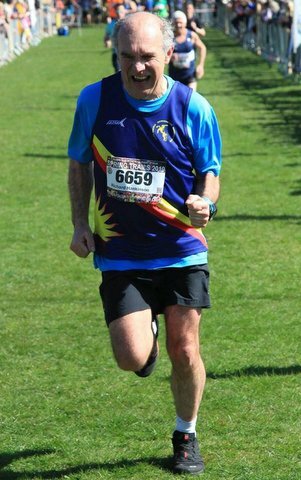 3/3/19 Anglesey half marathon & 10k. In the 10k race we had three runners. Congratulations to Gwion Roberts on his first race Win. 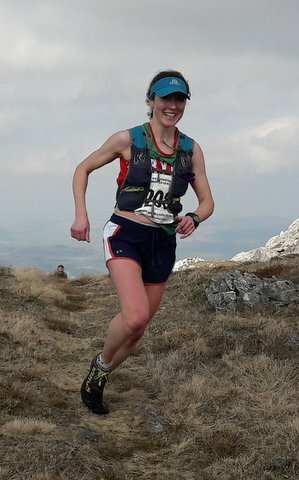 Gwion finished in 32:23 and was followed by Allanah Fenwick who claimed 3rd F40 in 45:18 and Nia Evans in 50:46. In the Half marathon we had another three Meirionnydd runners competing. First home was Jimmy Carter in 1:28:27 followed by Shane Griffiths 1:43:27; Shane Jones 1:52:19 and Elly Downing in 2:15:40. 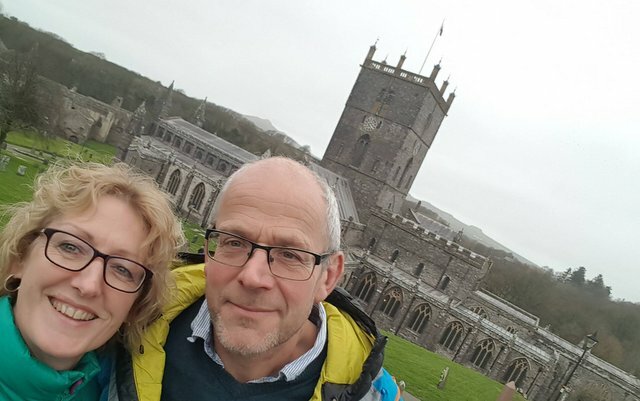 Elly Downing said "Anglesey Half Marathon, I don’t think I’ve done a road half marathon for four years...since last time I did this one (and stormed it, setting a new PB). So wind the clock forward four years, I planned to try and smash that PB. However, I didn’t stick to the plan, didn’t do enough road runs, or speed work - just the fun stuff. I knew I wouldn’t get the PB - they don’t just happen on the day. I knew what I could do right now and that’s what I did. I got out of the car (nearly didn’t). I got to the start. I ran. I kept running. I smiled a bit. I liked the hills, and the snippets of water and mountain views that the weather allowed. It felt good, I was breathing hard in places. I only looked at my watch once. It was cold and wet, and everything hurt from mile 10 onwards. Fab few minutes running with my race angel near the end - thanks lovely, it was great to see you. 10 mins slower than 4 years ago, but at least I know where I’m at. And of course, I know what I need to do. Lots of positives from today - I beat the pre-race demons, I ran all the way, I ran my own race and seeing my club mates and running friends is just the best." 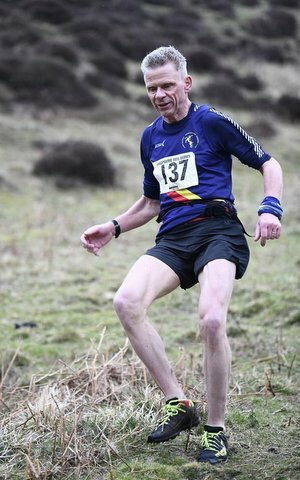 Richard Hankinson ran the Rhayader 30k finishing in a time of 2:55:31. Richard Hankinson said "Rhayader 30k round the dams last Saturday. I entered this in the days when I was doing more road running (last year was cancelled due to snow and ice), so curious to see how it would go. Fairly happy with 2:55 in the circumstances - it was windy out there and the legs weren't too keen! Really heartened to have a sprint finish left in me at the end of that. For anyone thinking of doing the run, it's a good one with nice views and a fair bit of ascent early on - great practice for anybody thinking of doing a marathon later in the year. 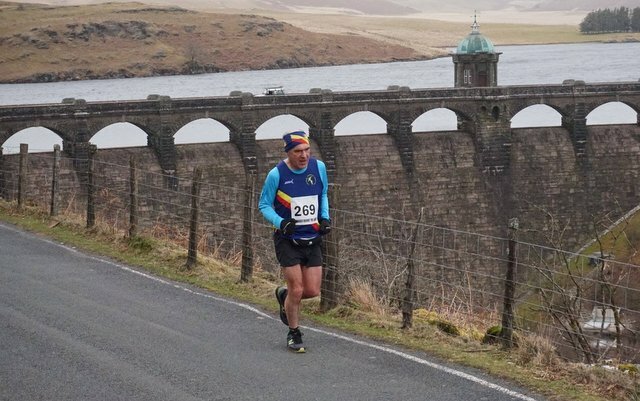 Rhayader 30k round the dams last Saturday. I entered this in the days when I was doing more road running (last year was cancelled due to snow and ice), so curious to see how it would go. Fairly happy with 2:55 in the circumstances - it was windy out there and the legs weren't too keen! Really heartened to have a sprint finish left in me at the end of that. For anyone thinking of doing the run, it's a good one with nice views and a fair bit of ascent early on - great practice for anybody thinking of doing a marathon later in the year." 2/3/19 Dewi Sant Half Marathon & Marathon. 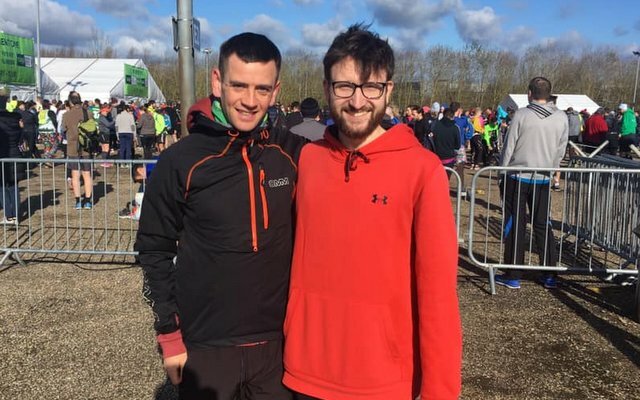 Dylan Evans ran in the Full Marathon and finished 1st M50 in 4:40:39 and Jude Evans ran in the half marathon finishing in 2:40:45. 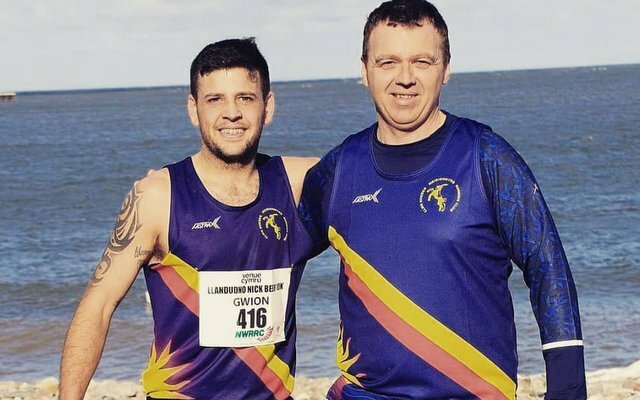 Jude said "Today I ran my 21st half marathon on the stunning Pembrokeshire coastal path. Ras Dewi Sant certainly ticked all the boxes, well organised and marshalled and if you dared to look up from the slippery, rocky path the views were amazing!" 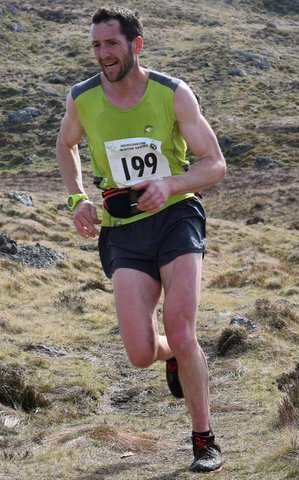 Jeremy Randell was the sole Meirionnydd runner at the Carding canter. Jeremy finished in a time of 52:47 to claim 3rd M55. 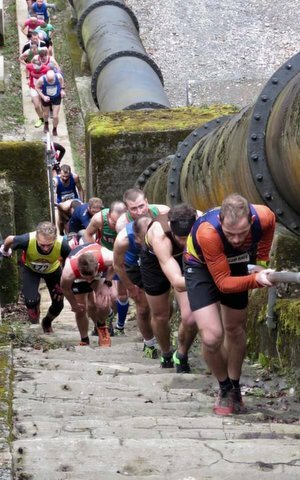 Sheeptracks is a challenging 27km distance race introduced in 2018. 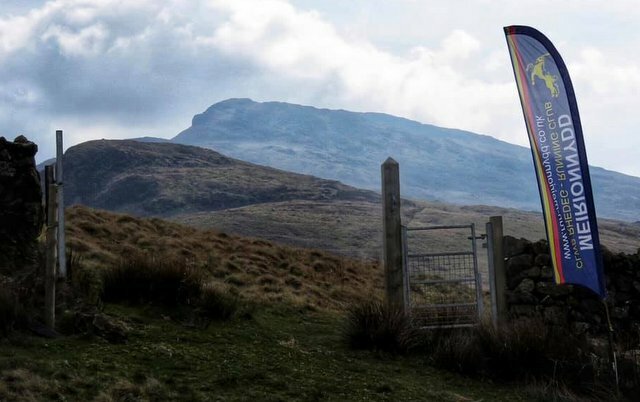 With unmarked trails throughout, the course traverses the east & west flanks of the Clwydian Range visiting checkpoints positioned to offer a wide scope of route choice. The most efficient racing line has been designed to follow the wonderful natural lines created by the master path builders, our wonderful welsh mountain sheep. The course changes every year to keep the race from growing stale. 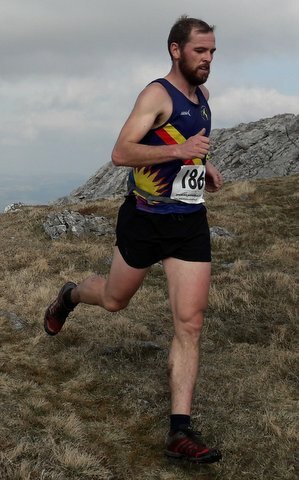 Tristan Evans was the sole Meirionnydd runner he claimed 3rd Senior in a time of 2:53:56. 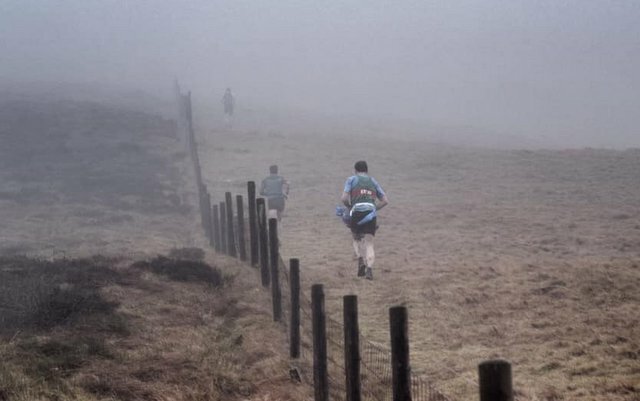 23/2/19 Slaithwaite slog, Half Marathon. 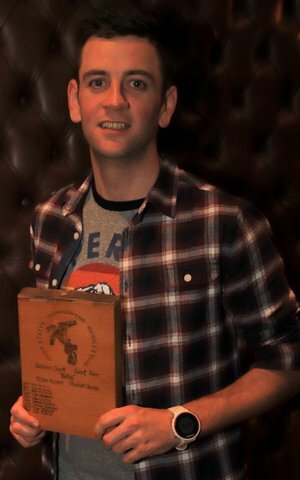 Richard Hankinson ran in the Slaithwaite slog Half marathon finishing in 1:51:13. 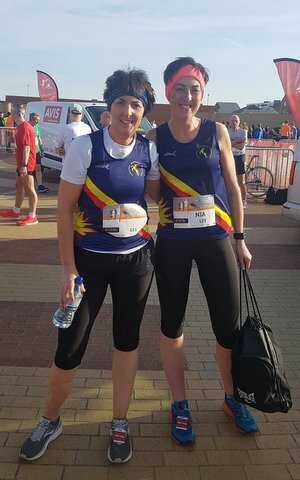 Two Meirionnydd runners ran in the Rhyl 10 Miles. First home was Nia Evans in 1:31:34 followed by Helen Wyn Jones 1:38:22. 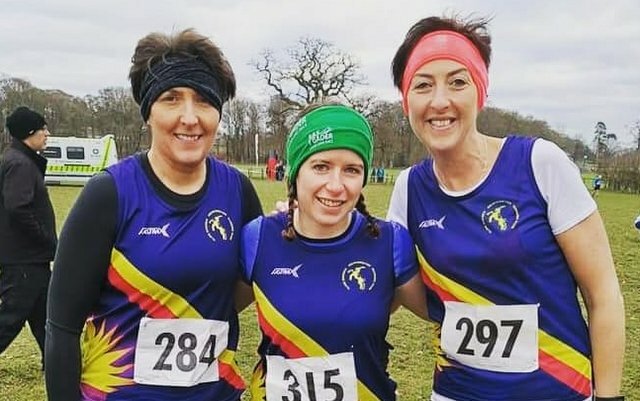 17/2/19 Village Bakery Half marathon and North Wales Championship. 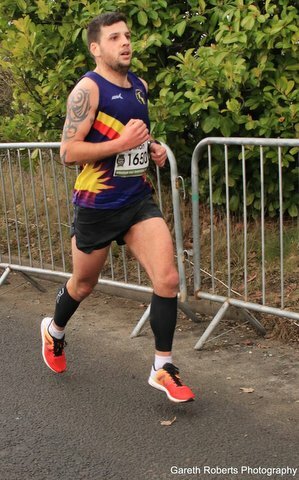 10/2/19 Nick Beer 10k, Llandudno. 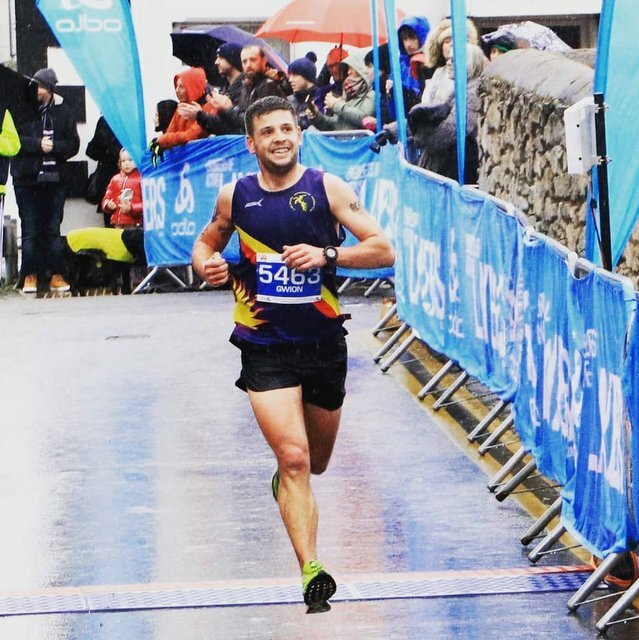 Gwion Roberts was really happy with 4th position in 35:56 in one of the toughest 10k courses in North Wales. Tomos Slattery made his debut in blue smashing it under 1 hour in 57:11 and Sheila Symonds 2nd F75 in 1:58:57. 9-10/2/19 Titterstone Clee & Longmynd Valleys. 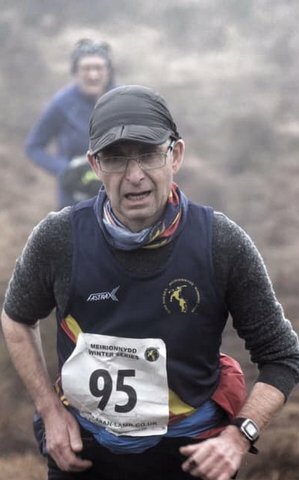 Jeremy Randell Did the double this weekend; Titterstone Clee finishing in 25:29 to claim 2nd M55 on Saturday in a howling gales with a smattering of sleet and on the Sunday the Longmynd Valleys. Wich Jeremy finished in 2:20:16 with interesting conditions underfoot (one step forward and two back on the steepest climbs). No PBs but a fun weekend! 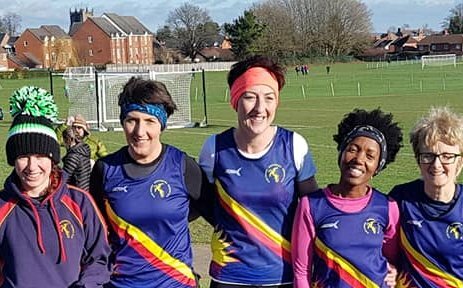 2/2/19 North wales Cross country League, Oswestry. It’s been a good season for the men we battled hard to try and push for a top 3 finish. We just missed out on second and settled for 3rd overall in our first year back in division 1. We had some individual awards for the season, Tom Roberts was 2nd SM and 2nd overall, Alun Williams 1st M35, Jeremy Randell 2nd M55. But the biggest achievement and most positive feeling is that we had a full ladies team for every fixture. Nia Ty Du has done an amazing job and it’s nice to see the girls supporting her and actually enjoying the races. Tom and Nia and really appreciate the effort throughout the season. 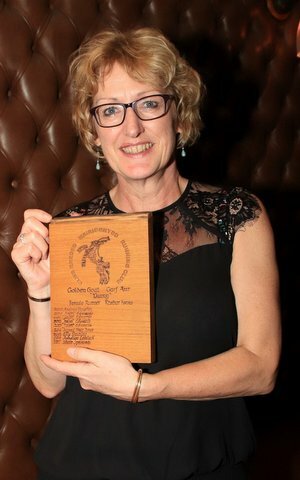 Diolch yn fawr i pawb ddaru cymrud rhan. 26/1/19 Club Dinner & Prize evening. The evening after the Tarren Hendre race we held our annual Dinner at the Ship in Dolgellau. There was an excellent turnout and great evening enjoyed by all. 26/1/19 Tarren Hendre, race 2 in Winter series. January 26th saw the 16th Ras Tarrenhendre. 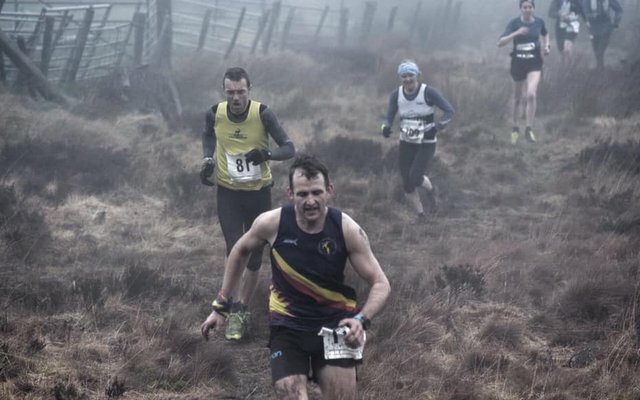 The weather was typical for this race, not cold in the forest but blowing over 50mph and visibility down to 50m on the tops. 75 runners turned out, locals, winter series regulars and visitors from Derbyshire and even as far as Harwich. Local knowledge proved useful as several runners chose, despite the weather, to abandon the clear running line along the fence for the quicker southern route and came badly adrift by missing the awkward turn off in the cloud. 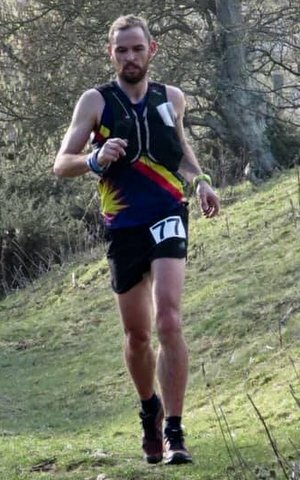 Race winner was the home club’s Tristan Evans taking his first outright win on a fell race with strong performance, leading throughout and winning in 52:44, 2:30 ahead of Eryri’s Richard Roberts with Karl Steinegger (Ambleside) taking third place. 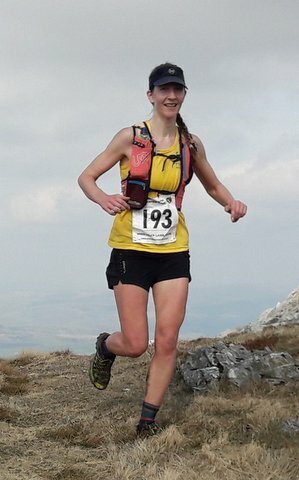 Women’s race winner Sara Willhoit (Mercia) took 8th place overall with time of 58:31 beating Eryri’s Miranda Grant by 2:30 mins, with Hebog’s Sian Williams coming third in 1:02:41. Junior Jack Westwood of Aberystwyth University was in 19th place at checkpoint 1 but was reeled in by Maldwyn Harrier Gruffydd Martin who from 37th rose through the field to win the category 23rd overall in a time of 1:04:05 with Jack 30th in 1:05:45. 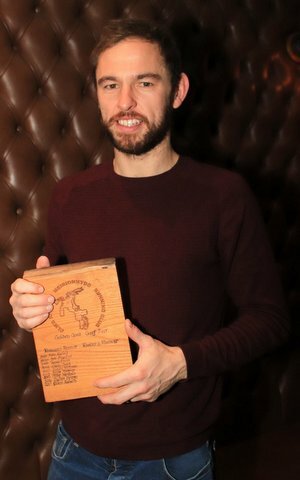 The M40 category went to Eryri’s Mathew Fortes in 56:52 and team mate Stephen Jones took the M60in 1:03:38 a little outside his own course record but just ahead of Victor Belsham of Denbigh Harriers first M50 in 1:03:59. 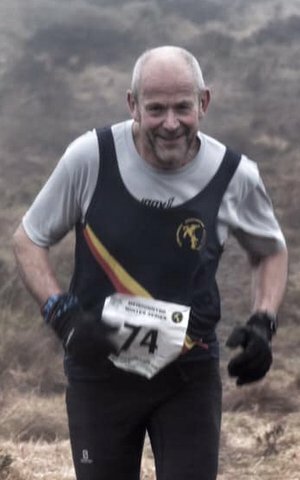 Garry Gunner (Croft Ambrey) finished 57th to take the M70 prize in 1:29:34 a comfortable 5 minutes ahead of Alwyn Oliver of Eryri. Thanks to Aberdovey Search and Rescue team, and all marshals and helpers. Winter series after two races. 19/1/19 Buff Winter Trail, Coed y Brenin. 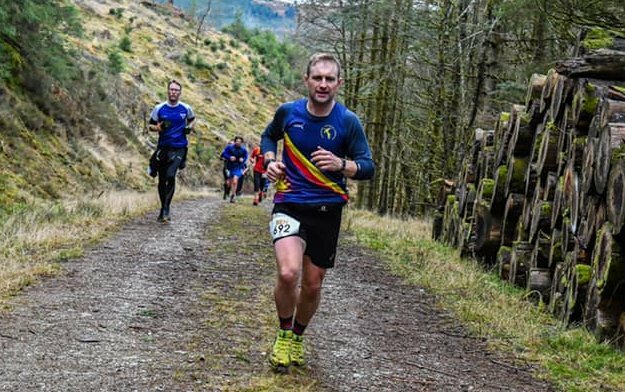 Seventeen Club runners ran in the Buff Winter Half Marathon at Coed y Brenin. 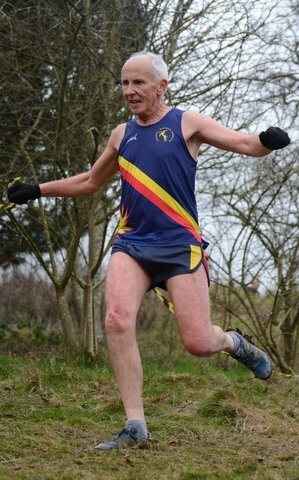 12/1/19 North Wales Cross Country League Northop. 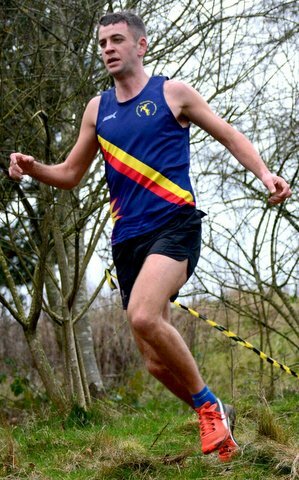 Eleven runners took part in the penultimate event in the North Wales League at Northop. The men Finished third on 700 points with Buckley in second place and Shrewsbury in the lead with 397. The women had another great turnout and finished in 5th place with 1033 points. 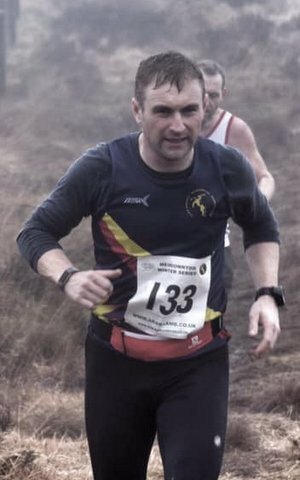 5/1/19 North Wales Cross Country Championships. 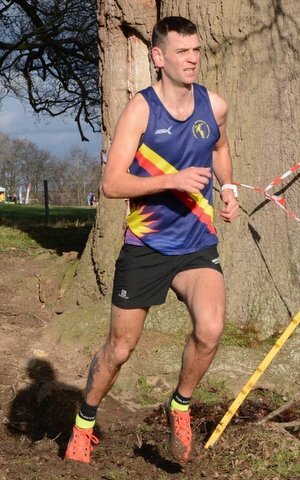 Seven club runners ran the North Wales Cross Country champs at Rhug. The ladies fielded a full team with Nia Ty Du, club debutant Nia PenRhiw and Helen Wyn Jones all having great runs. The men’s race was fast and a shock to the system after the Christmas break! Tom Roberts managed to hold on to 3rd overall and 2nd SM. 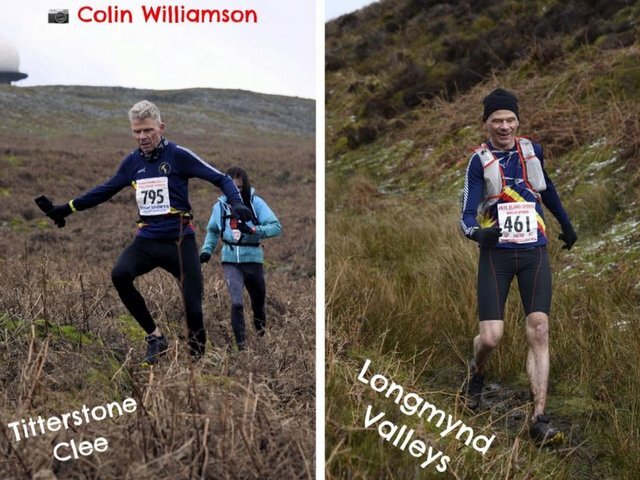 Alun Williams was 5th and took gold in the M35 category, Gwion Bobo Roberts finished inside the top 10, and Gerald Cooper rounded off a good day for the goats.